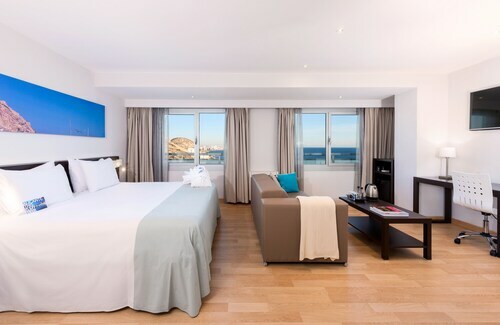 This family-friendly Alicante hotel is located near the beach, within a 10-minute walk of Archaeological Museum of Alicante and Postiguet Beach. Alicante Harbour and Alicante Bullring are also within 1 mi (2 km). Alacant Terminal Station is 29 minutes by foot. 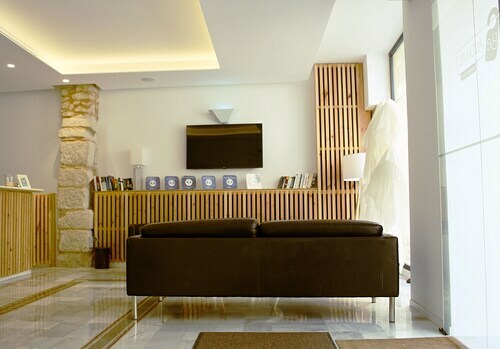 Located in Alicante City Centre, this hotel is steps from Gravina Museum of Fine Arts and Alicante Harbour. Postiguet Beach and Central Market are also within 15 minutes. Alacant Terminal Station is 20 minutes by foot. 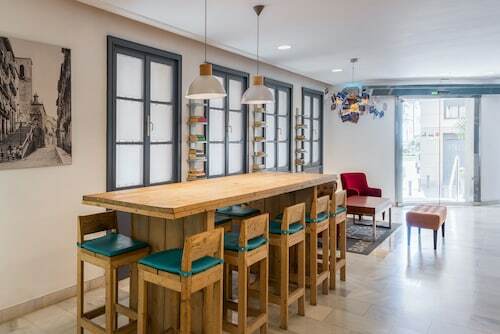 Located in Alicante City Centre, this apartment building is steps from Fogueres Festival Museum and Central Market. Alicante Harbour and Alicante Bullring are also within 10 minutes. Alacant Terminal Station is 14 minutes by foot. 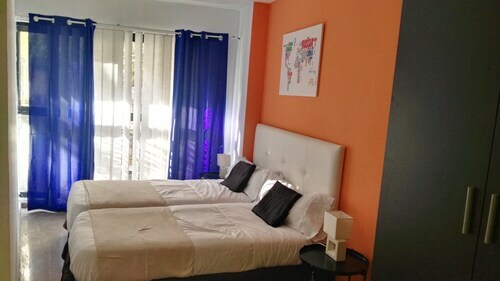 These hotel accommodations are located throughout the area in Alicante. 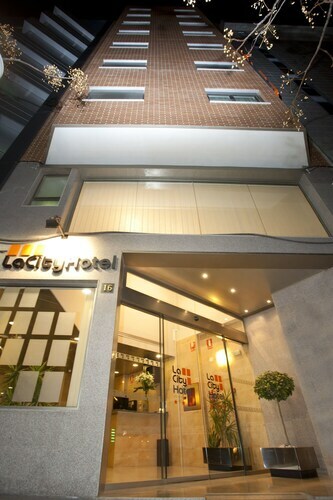 Located in Alicante City Centre, this pension is steps from Alicante Museum of Contemporary Art and Alicante Town Hall. Alicante Harbour and Postiguet Beach are also within 15 minutes. Alacant Terminal Station is 19 minutes by foot. Situated near the beach, this pension is steps from Bulevar Plaza and El Corte Ingles Shopping Center. Alicante Harbour and Central Market are also within 1 mi (2 km). Alacant Terminal Station is 5 minutes by foot. Situated in Alicante, this hotel is within a 5-minute walk of Bulevar Plaza and El Corte Ingles Shopping Center. Alicante Harbour and Central Market are also within 1 mi (2 km). Alacant Terminal Station is only a 2-minute walk. TRYP Alicante Gran Sol Hotel is a 7-minute walk from popular Postiguet Beach. Guests can also walk 10 minutes to the city center and its buzzing markets. The hotel is a 7-minute cab ride from Santa Bárbara Castle medieval fortress, and guests can catch a boat from the port to Tabarca Island. Located in the heart of Alicante, this hotel is within a 10-minute walk of Placa de los Luceros, Central Market, and Alicante Bullring. Alicante Harbour and El Corte Ingles Shopping Center are also within 1 mi (2 km). Alacant Terminal Station is 9 minutes by foot. 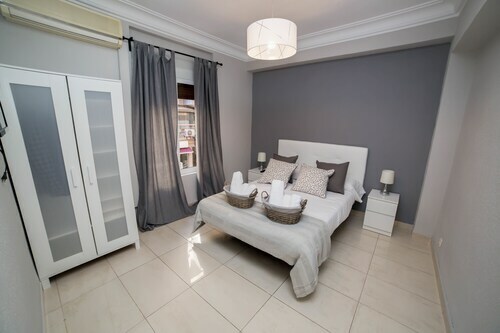 Situated in Alicante, this pension is within a 5-minute walk of Central Market and Alicante Bullring. Alicante Harbour and Postiguet Beach are also within 15 minutes. Alacant Terminal Station is 16 minutes by foot. Are you thinking it's time to head on down to Bulevar Plaza? Some wanderers like to see the national capital, Madrid, beforehand. Once you're done there, it's 220 miles (354 kilometers) to Alicante, where the attraction is to be found. After an exhilarating day of exploring, you'll be able to decompress at any one of the accommodations close by. Within 0.6 miles (1.0 kilometer) of Bulevar Plaza, you'll discover 21 candidates. 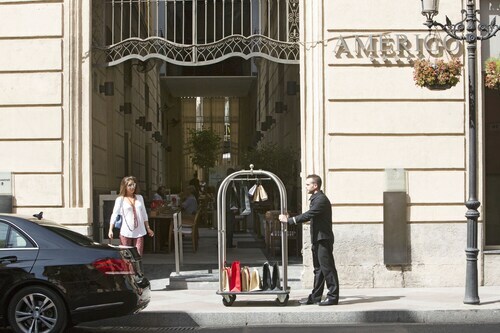 Start by looking at the AC Hotel Alicante by Marriott, Eurostars Lucentum and La City Hotel. You are guaranteed to get a warm greeting in addition to a value-for-money room fee when you check into one of the economical hotels that are available. 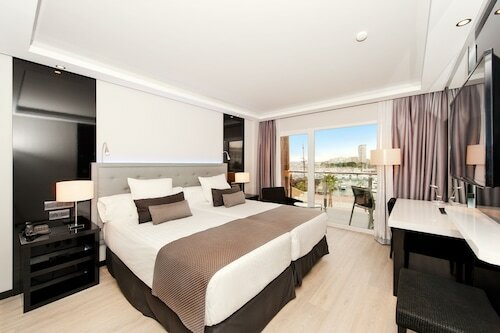 Consider the Estudiotel Alicante, a mere 0.1 miles (0.2 kilometers) away, or, there is the Hotel Rialto, which is 0.4 miles (0.6 kilometers) away. Worldly wanderers should enjoy the pleasant rooms at one of the numerous premier hotels found nearby. Consistently recommended are the Hotel Sercotel Suites del Mar and the Hospes Amerigo, a mere 0.8 miles (1.3 kilometers) and 0.5 miles (0.8 kilometers) away, respectively. Enjoy the stimulating aroma of freshly brewed coffee or browse the menu for something sweet at Coffispeer. It's a short walk away from Bulevar Plaza. If you're after something more substantial, Telepizza is also close by and offers a wide selection of appetizing meals. Kick back and relax with a drink. RED CORNER STATION is another short walk away, and the bar staff will be all too happy to wait on you. Acquaint yourself with the extensive and interesting history of Placa de los Luceros. It's a good idea to save some space in your suitcase if you plan to go to El Corte Ingles Shopping Center. Spice up your evenings and experience the local theater scene. Alicante Principal Theatre puts on a range of productions which you can attend. If you want to purchase some local wares and delicacies, Central Market is the perfect place for you. If you couldn't get to the more well-known museums, grow your knowledge at Fogueres Festival Museum. To get to Bulevar Plaza, you could consider catching the train. The nearest station, Alicante-terminal, is only 0.2 miles (0.3 kilometers) away. How Much is a Hotel Room in Bulevar Plaza? Hotels in Bulevar Plaza start at $31 per night. Prices and availability subject to change. Additional terms may apply.